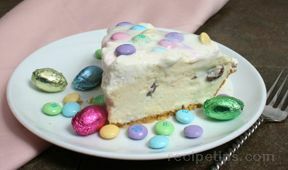 Fun to make and fun to eat, this Easter pie will disappear right before your eyes. The eye-catching Easter M&Ms makes this a delightful recipe for kids. 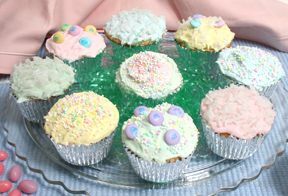 Try Easter Jello Jigglers for another fun Easter dessert recipe. In a large mixing bowl, beat the cream cheese until fluffy. 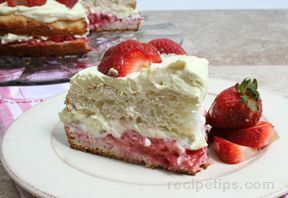 Gradually mix in the condensed milk until smooth. Add the milk and pudding. Pour half of this mixture into the bottom of the crust. Sprinkle chocolate egg halves over the pudding mixture. Top with the remaining filling. Cover the pie with a layer of whipped topping. Chill in the refrigerator for one hour. 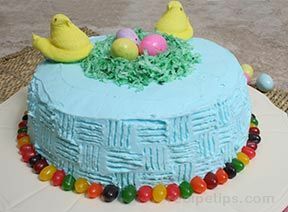 Sprinkle the top with Easter colored M & M chocolate candies and allow to chill for two more hours. "I forgot all about this pie! I made it last year and we loved it. I think I will make it again this year. It was a fun Easter pie." "I made this pie for the kids for Easter and they loved it. It was a fun dessert to serve for our Easter dinner. The adults thought it was pretty good too!"